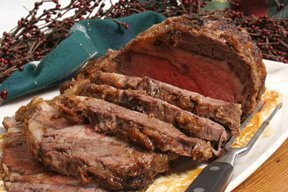 Easy to prepare, prime rib is a delicious dish to serve for a special holiday dinner with family and friends. This prime rib recipe will provide you with a mouth-watering meal that everyone will enjoy whether it is Christmas, New Year's or any other special occasion. A simple spritzer for a non-alcohol alternative or a hot cranberry tea to keep you warm, see these and other beverage ideas for your holiday get togethers. Use our step-by-step guide to help you through purchasing, preparing, cooking, and carving prime rib for your Christmas dinner.